This month I am focusing on old, sometimes forgotten recipes that our grandma's used to make. This week I am making Old fashioned Creamed Corn. I have to confess, I have always hated "Cream Style Corn". Hated it. blech.... BUT I have always only tasted the store bought canned variety. I came across this from scratch recipe from an older lady in my church congregation, and knew that I had not given Creamed Corn a fair shake until I've tried it from scratch. So, now I know. the real creamed corn is amazing! Not even CLOSE to the icky canned version! I mean we are talking real cream, real butter here, so this will make it to my Thanksgiving table this year. It also would make a wonderful base to any cornbread, corn pudding, or other recipe calling for creamed corn. Jan's Confession: The real recipe calls for 1 doz. ears of corn, with the kernels cut off, and the ears scraped to get all the juices from the cob. I used a pint of home canned corn rather than the ears of corn (But essentially I had the same thing, right?) Frozen corn will give you a fresh tasting substitute, or a store bought can of regular corn in a pinch. In a heavy saucepan or skillet over low heat, cook the corn, butter, salt, pepper and sugar for 15 minutes, stirring frequently. In a bowl, whisk together cream and flour. 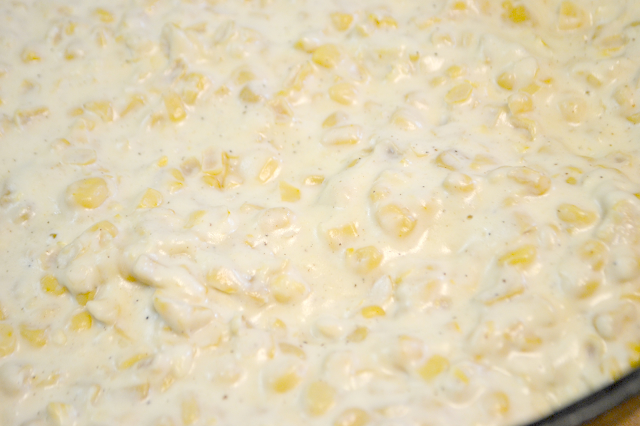 Stir the cream mixture into the corn, let simmer for about 2 minutes until desired thickness and remove from heat. If it ends up a little too thick, you can whisk in some additional cream or milk to thin it out.